March is Red Cross Month. The American Red Cross was founded in 1881 by Clara Barton and others. It is one of the 186 private, national societies of the International Red Cross and Red Crescent Movement, formed in Geneva, Switzerland, in 1863 by Henry Dunant, which offer neutral humanitarian care to the victims of war. The American Red Cross distinguishes itself by also aiding victims of devastating natural disasters, such as the recent earthquake in Haiti. There are approximately 97 million International Red Cross and Red Crescent Movement volunteers worldwide. 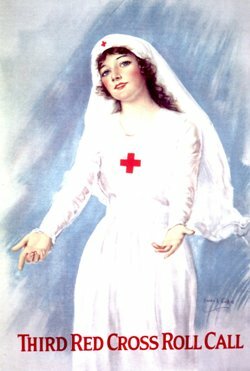 In this poster published by the American Red Cross, a woman in a white Red Cross uniform, including a white hat with trailing white veil, is standing with her arms outstretched. At the foot of the poster, in red letters, is “Third Red Cross Roll Call.” The American Red Cross and its local chapters conducted annual drives called Roll Calls, to enlist volunteers and solicit donations. This poster is by artist Haskell Coffin and is dated “circa 1919.” It can be found on the NLM Images from the History of Medicine database.